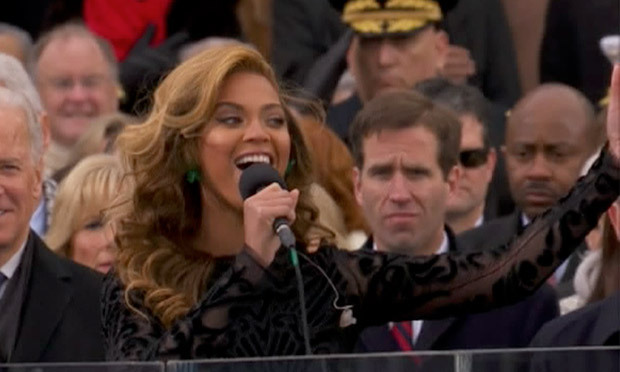 Monday’s inauguration festivities captured plenty memorable moments; but it looks like Beyonce’s electrifying rendition of The Star Spangled Banner will be the talk of the town until whenever – and not for the right reasons. Apparently comparisons to her version and the one belted out by the late Whitney Houston were accurately categorized considering the fact that Houston also lip-synched her way through the entire verse in her much-heralded display back in 1991. Sigh! It looks like Jay-Z’s better half is not as perfect as we were afraid she was, which proves once and for and all that she is only human! We all wanted to take in the glorious energy of the moment and believe that the ultimate songbird in a flawlessly uncensored performance was serenading our perfect President. But alas! According to Kristin DuBois, a rep from the United States Marine Band, despite the band performing live, Beyonce opted to take the safer route by utilizing a pre-recorded vocal track. Apparently the Crazy in Love singer didn’t have the opportunity to rehearse with the Marine Band and took necessary precautions to ensure a seamless outcome. Either way, it can’t be denied that the vocals are all Beyonce but there is still a certain level of disappointment that comes with the fact that she took the easy way out. Hmmm…not sure how we feel about this revelation – aren’t performers supposed to rise to the occasion?